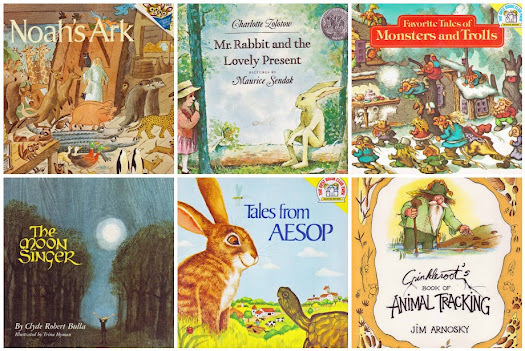 Mr. Rabbit & the Lovely Present by Sendak: Reviewed here. Sold here. The Moon Singer by Hyman: Reviewed here. Sold here. Shooting Stars by Bohatta: Reviewed here. Sold here. Open Your Eyes by Abisch & Kaplan: Reviewed here. Sold here. The Story of Babar by de Brunhoff: Sold here. The Enormous Crocodile by Dahl & Blake: Sold here. Grover & the Everything in the Whole Wide World Museum: Reviewed here. Sold here. Professor Noah's Spaceship by Wildsmith: Reviewed here. Sold here. Sheep of the Lal Bagh: Reviewed here. Sold here. Child's Book of Poems by Gyo Fujikawa: Sold here. Come check it out! There are some $3 paperbacks available, too. Great Monday Give: Mystery Give Extended.